A comfortable apartment for up to 4 people situated on the forth floor of a beautiful building (with a lift/elevator) in the Old Town, a central district of Krakow. It consists of a bedroom with a double bed, a lounge with a double convertible sofa (connected with a kitchenette) and a bathroom with a shower and a washing machine. 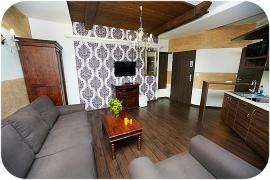 Wi-Fi internet and Satellite TV provided. It is possible to park your car in the underground garage next door. The fee is 35 PLN/day. Reservation is required. The building is guarded 24/7. Nearby guarded parking is 50 PLN/day. It is also possible to park in the street 3 PLN / hour and free between 8.00pm and 10.00am and weekends. We would like to inform you that it is possible to accomodate larger groups of guests in the same location in other apartments named Biskupia.